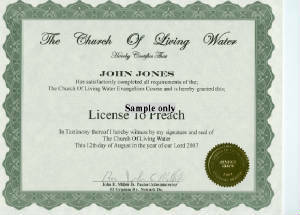 License to Preach Certification $25.00. You do not need to be a paypal member to use your credit card. we will only accept USA currency, or Personal checks from banks here in USA. If you want the recognition of being a Minister of God but do not desire to perform Marriages, then this is the credential for you. 1. In a few words, what does this poem say to you? 1. the _____ of every _____ is not to bring the lost to the _____ but to take the _____ to the lost. 2. Because we are God's only plan He is not not using these three things _____ _____ _____ . 5. The best way to _____ up the town is to see _____ clean up _____ . 6. Because all men are _____ blind. HOW CAN I BE AN EFFECTIVE WITNESS? 1. Don't _____ the Spirit (by _____ }. 2. Have a deep _____ that all _____ without Christ are _____ and doomed. 3. To overcome fear remember His _____ is with you. 4. Be more _____ about winning _____ than winning _____. 5. If you don't know the _____, assure them that the _____ has one, and _____ to get back with them. 7. What key words are key words to remembering how to give our testimony. 8. "All who attempt to win the lost must speak to _____ for _____ before speaking to _____ for _____." 9. The souls of the _____ are with the _____. 10. Focus on allowing God to nurture the _____ _____ _____. 1. Where in the Bible does it say We are commanded to preach the Gospel. 2. The two basic facts of the Gospel are these: _____ _____ _____ _____ _____. 3. What is the Greek word for "for"? 5. "Wherein ye stand" - Perfect tense - one who _____ received the _____ will _____ forget it, but will remain _____ on it and saved by it! 7. What is the crux of the Gospel and the emphasis of the New Testament? Click on link below to get to lesson. 1. Talk about natural things for awhile to a potential convert to break down walls or barriers between you and them. 2. After talking about then begin thinking of a way to start talking about the _____. 3. A good approach question is, "How do you think a person becomes a Christian?" 4. If you were to _____ today and stand in front of _____, and He was to say to you: 'why _____ I let you into my _____?' what would you say?" 5. There are 5 facts that any unsaved person needs to understand and believe in order to be saved, what are they. 6. What do Facts #1 and 2 point to? 7. What do Facts #3 and # 4 point to? 8. What do Fact # 5 point to? WHAT DO I SAY AS I WITNESS? 1. What does the word sin mean? 2. Sinful _____ are just as wrong as _____ acts. 3. Romans 6:23 - "For the _____ of sin is _____; but the _____ of God is eternal life through Jesus Christ our Lord." 4. Physical death is separation of _____ _____ _____. 5. Emphasize that Christ paid a _____ He did not _____. We owe a _____ we cannot _____. 6. Grace is the "_____, _____, and even many times _____ kindness and _____ of God." 7. Show them that by _____ in Jesus Christ they will be ______. 10. One can be assured of his salvation by how he feels. 1. Be careful when dealing with people of the. _____ _____. 2. "The best _____ in the _____ is _____ if you don't take it." 3. Don't be in a _____. Relax; Make them feel at _____ and _____. 4. Don't lead someone into the trap of _____ _____. 5. Don't carry on a heated _____ or loose your _____. 7. Allow God's Word to take _____. Allow God to _____ the person's _____. 8. Who is the soul winner? 9. In order to win souls we must be persuasive when we evangelize. 10. If you make a _____ there will be no _____ change. Those God _____, get _____! 1. Who has the best evangelism pattern for us to follow? 2. Two extremes are prevalent today in the name of "evangelism": what are they? 3. It is proper to have the mentality that evangelism should primarily take place in the local church. 4. Jesus remained a _____ when among the _____, He did not become _____ with them!" 5. Today, many Christians are _____ not _____ (seeking to blend rather than contrast). 6. Don't be a _____ Christian! Don't be an _____! 9. What did Jesus not allow to stop Him from spreading the gospel? 10. Beware of _____ yourself from those of other _____. They need to hear the _____, and may only hear it from you! 1. What was Pauls Motive in Evangelism? 2. What was Paul's manner of evangelism? 3. What was Paul's Method of Evangelism? 4. What was Paul's Message in Evangelism? 1. Tract distribution is a practical way of bearing "_____ _____"
2. Tracts take the place of verbal witness in all case's. 3. Do not memorize some catchy phrases that will attract people to the tract. 6. What is the hardest step in evangelism? 7. What does the W in Growth stand for? 8. What does the S in A-C-T-S stand for?